Finished layout number 9 for Finding You yesterday morning. I used really old patterned papers because when I started this layout I was too tired to go to the scrapbookstore to buy paper to match the picture I previous made with Adobe Photoshop Elements. I liked the challenge to use old paper (read something about that in the newsletter from Ali E a couple of weeks ago) so I went for it. These were the only pp in my stack (or is it stock?) that matched the colors of the picture. There is hidden journaling underneath the purple paper. The photo I took of the layout is horrible but the light was terrible at that particular moment. Maybe i'll try it again some other time. I have used some silver accents on this layout but because of the terrible light they turned out to be yellow. 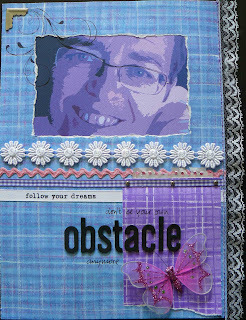 Supplies: pp (Karen Foster), cardstock (Bazzill), thickers (American Crafts), butterfly (Xenos), silver photocorner and brads (OTC), lace and ribbon (market), white ribbon with follow your dreams (? ), embroidering thread, black DVD pen, stamp (Rhonna Farrer), Stazon ink. wow! you are going to have one amazing album once you finish all these finding you challenge.